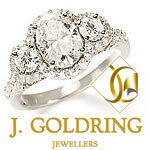 J. Goldring Jewellers has been providing fine and exciting jewelry and gift items to the general public. We pride ourselves on the quality and integrity of the jewelry that we choose to include in our collection. J. Goldring has now created an exclusive line of goods available on the Internet, reaching a large market throughout the world. We invite you to browse through our site and enjoy the fine assortment of jewelry and gifts for men, women and children available directly to you from J. Goldring Jewellers. Get more for your wedding! Don't forget to mention ChossonKallah.com when visiting JGoldring.